Secretary Rice, on a whirlwind trip to Haiti, glosses over problems that are doomed to chain-saw upcoming elections. Iraq’s election morass is modest when compared to Haiti’s. The State Department is much softer on its incompetent and malevolent interim Haitian Prime Minister Gerard Latortue, than it is on a string of Central Asian countries like Uzbekistan, even though the former’s derelictions are equally deplorable. Rice sees only qualified evil when it comes to the jailing of the islands major democratic leaders who cannot participate in the election because they have been incarcerated on no, or purely invented charges. Does Rice know something? – that Neptune and Jean-Juste will be released hours after the election; thus preventing Lavalas from running and likely winning, but allowing her, at the same time and after the fact, to say that U.S. intervention got them released. U.S. strategy is to keep Lavalas from power no matter the tortured reasoning involved. 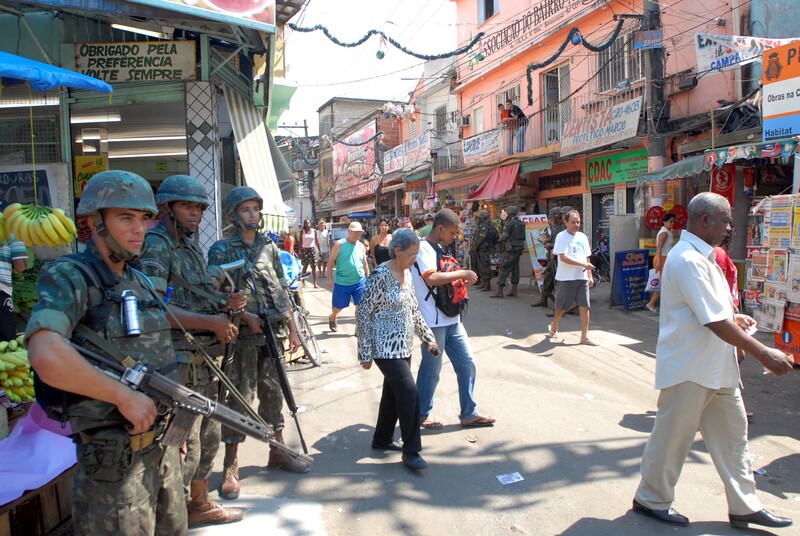 U.N. political representation in Haiti and the Brazil-led peacekeeping force have failed in their dual mission to bring stability and law and order to Haiti. Haiti is a country you can’t easily get your arms around and if you do, it will beat you off in a moment. Uzbekistan’s human rights abuses get a lot of attention, but Haiti’s much greater violations dwell undisturbed under a U.S. rug. On an in-and-out trip to Haiti on September 27, Secretary of State Condoleezza Rice stressed the importance of Haiti’s upcoming presidential balloting on November 20 to her “democratic promotion” campaign, aimed at legitimizing her alleged Haitian game plan for returning to constitutional rule. Haiti’s democratic system was traumatized for the second time within several years, when the U.S. orchestrated the ouster of its de jure president, Jean-Bertrand Aristide, on February 29 of last year. In actuality, Rice is anxious to rid her agenda of Haiti as close to cost-free as possible. Any administration that selected as its interim leader of the island a figure as reprehensible as Gerard Latortue, is interested in “democracy promotion” only as a sound-bite. Rice’s pronounced apprehensions over the turbulence bedeviling Haiti’s preparations for its ill-starred November 20 elections, are somewhat less startling than what she chose not to say. Not a word was mentioned about the human rights violations which are being repeatedly committed by the Haitian National Police along with the UN peacekeepers, and only a few musty words were given over to the catastrophic state of the country’s judicial system, which tolerates the outrageous detention, on totally fabricated charges, of such notable political prisoners as Father Jean-Juste and former Prime Minister Yvon Neptune. Meanwhile, if the election does take place, Rice is not likely to find a problem in validating it as fair, because Washington will state, ex cathedra, that this was the case, and who would care? Making such a statement would be merely one more example of the grotesque parody of a democratic electoral process that is now being implemented in Haiti by Latortue’s non-redeeming interim regime. As noted, Washington created Gerard Latortue, who was far better known for living a low silhouette life in quiet semi-retirement in a gated community in Boca Raton as well as for his radio program over a local station, than for having any visceral connection with his motherland Haiti, a country that he had scarcely visited in recent years. Simply put, we are witnessing a fraud in the making. Looking at the manner in which Haiti is now being run, you will have to come up with the judgment that interim Prime Minister Latortue is the perfect candidate to head FEMA – he has established beyond question that he is the quintessential total incompetent, and that he has neither the heart to relate to a populace, nor the administrative capacity to run a country. Let alone devoid of any leadership qualities, Latortue has plunged a dagger through the heart of Haiti’s scarcely functioning democracy by allowing brigands and knaves to be given positions of privileges. Both in style and substance, Haiti under Latortue has been blasphemed. During her trip to Haiti, Rice implored the interim government to speed up planning for November’s elections and had some misty words about speeding up trials, but she did not use the opportunity to order that the State Department’s legman Latortue must release all political prisoners, headed by Jean-Juste and Neptune and that the personal security of those affiliated with the pro-Aristide Lavalas party be guaranteed, in order for the upcoming election not to be a greater parody than it already is. The fact that Rice was spotlighting attention on the need for speeding up election preparations may have been somewhat harsh, considering that the Haitian government has been creating many new polling stations. Unfortunately, most of them are being furnished in the better off urban areas of the country, while the slums on the outskirts of the city and rural areas are being woefully neglected. Clearly, Rice’s statements indicate that she is aware that all Haitians will not have equal access and the same opportunity to participate in elections which she is on record as seeing as being a “powerful weapon” and as “a precious step on the road to democracy.” However, assuming such access may be a patently inaccurate conclusion on her part, considering that a majority of Haitians live on under two dollars a day, and will be hard pressed to afford the trip to distant election booths. When it comes to acceptable norms for a free and fair election in Haiti, Secretary Rice has lowered the bar so far that it is now scraping the ground. On November 20th, Haiti is scheduled to hold the first round of its presidential election. Indisputably the most impoverished and forlorn of all the hemispheric nations, Haiti also has been the nation most frequently singled out for U.S. intervention in the region. Such interventions, such, as the one which took place in early 2004, had the U.S. orchestrate the ouster of constitutionalist president Jean-Bertrand Aristide. Under him, according to Washington, Haiti had become a “failed state” and he had to go because under his friend, President Préval, Haiti allegedly had staged “fraudulent elections.” This became the justification for the likes of former Senator Jesse Helms to pressure the White House to turn off the spigot for crucially needed foreign aid. Ballot box stuffing, intimidation of the electorate by armed cutpurses, as well as ghastly massacres of potential voters have routinely occurred during Haiti’s tortuous history. The few opportunities that the country has had to break out of its dismal cycles of foreign control or strongman repression eventually ended in wreckage. In less than two months, Haitians will again go to the polls to participate in an election that will be so blemished that Rice will be unable to sell it to the American people, let alone to Haitians as being the real thing. As a result, it is all but certain that the island will be denied taking advantage of one of its rare opportunities to institutionalize democratic procedures. Under the auspices of the outrageously unqualified and malignant Latortue, together with the grossly disappointing performance of the Brazilian-led UN peacekeeping force, and the decent but indecisive Chilean political broker dispatched by the UN’s Kofi Annan, distressingly little has been accomplished and the plight of the average Haitian is as bleak as ever. Haitians are once again being urged to the polls to vote for a president under totally unacceptable conditions, while the UN has created for itself the unenviable record of being far more adept at killing innocent Haitians than bringing stability to the country. What is almost worse is that Brazil’s president Lula da Silva doesn’t even seem to care about the bad name that Brazil’s Haitian military operation is giving to his country. In moving ahead with a bankrupt Haiti policy, Secretary Rice fails to comprehend the despair of the Haitian electorate as it contemplates voting again for a president – as the island’s voters did in 1990 and again in 2000 – only to be certain that exercising the ballot will fail to achieve an electoral solution, but only more conflict and killings. Those who voted for President Aristide’s Fanmi Lavalas party in recent elections, only to see their vote later invalidated by Washington’s malevolence, can only wonder why they bother to even vote when it will be the U.S. embassy in Port-au-Prince who will be the final arbiter of how the island will be ruled. Haiti’s current political landscape seems eerily familiar to that which was left in the ruinous wake of the departure of Baby Doc Duvalier in 1986. If those times, when one murderous military regime came upon another, were a tragedy for the nation, then the plotting last year by the United States, France and Canada, together with the generous fig leaf supplied by the UN’s Kofi Annan, led to the voiding of the popular vote by the abrupt removal of Aristide from office. His immediate quasi-abduction to an African location, whose name was not even disclosed to him at the time, was the final insult to Washington’s pretensions as being democracy’s contractor in Haiti. Starting over a year ago, the interim government’s infamous ex-minister of justice, Bernard Gousse, began to systematically imprison (invariably without any evidence or charges) leading Lavalas figures, while at the same time he set much more relaxed standards when it came to the treatment of murderous rightwing villains – some of whom were released from jail in spite of the fact they had been found guilty of an array of brutalities. The anti-Aristide cabal led by the State Department never had a word that clearly condemned Gousse, who routinely violated constitutional norms to prosecute Aristide partisans, while convicted murderers like Louis-Jodel Chamblain, who former Secretary of State Colin Powell referred to as a “thug,” walked the streets with a beaming Gousse, a free man. Haiti’s widely assailed Provisional Electoral Council (CEP) declared some 30 candidates eligible to contest the November presidential elections. Their sheer number, along with CEP’s antique methodology, almost assures that a run-off will take place. Haiti’s political spectrum includes parties from the far-right, to centrist liberals, to socialists and even more radical parties. Even Baby Doc Duvalier is rumored to be considering to return to witness, but not necessarily run in the race. However, most parties are more tiny factions than bona fide parties. One particularly unsavory candidate who declared his candidacy was Frank Romain, the former mayor of Port-au-Prince, who was the subject of an extradition writ in 1989 for ordering a military unit to open fire upon voters waiting in line to cast their ballot, killing scores and forcing the abortion of that contest; this violence led to three years of bloody military-dominated-rule. How very little distance Haiti has come since then, as the arbitrary crushing of the poor continues in a nation that proudly introduced to the world, over two centuries ago, the beginnings of the human rights movement in this hemisphere. Secretary Rice’s baffling problem is that no party in Haiti’s history has been able to draw the numbers that ousted President Jean-Bertrand Aristide’s Lavalas party has been able to attract. Nothing that the State Department can do seems to lessen those numbers. From gaining 67.5% of the electorate in 1990, every ballot since has resulted in Lavalas winning by sizeable majorities. U.S. embassy officials have informed Washington that if Lavalas had been able to nominate either a Yvon Neptune or a Gérard Jean-Juste in the approaching elections, and have Latortue guarantee their personal security; there would be little doubt that history would repeat itself. If so, this would again have undermined Washington’s game plan to deny power to Lavalas. To restate the matter, there is no question that in any presidential race that would be internationally validated as being free and fair, Lavalas would have once again won decisively. Such an eventuality would pose an enormous conundrum for the administration since it would mark a grave set-back for State Department policy which was based on preventing the possibility of any return of Aristide influence to Haiti, an event it has gone to great length to prevent – including the arbitrary invalidation of his presidency by de facto exile. As of today, the Rev. Gérard Jean-Juste (a Catholic priest, as Aristide was in 1990), languishes in the National Penitentiary, and is not likely to be the Lavalas standard-bearer, although he is by far the country’s most popular potential candidate. Former President (and Prime Minister in the first Aristide presidency) René Préval, who in the past has been close to Aristide, has now entered the fray as an independent candidate, and whose organizational skills and positive reputation attracted tens of thousands of voters to newly register, could be a strong prospect in the field if he’s allowed to win and then run in the inevitable run-off. One faction of Lavalas has formed a coalition with Marc Bazin’s MIDH party, a particularly adroit move on the part of the former World Bank official, who, although long condemned for repeated acts of opportunism and self-glorification, in recent months has been displaying a seriousness of purpose in recognizing the genuine appeal of Lavalas to Haiti’s masses. Once considered a pariah by Haitian patriots and charged by many progressives and populists as being too close to Washington, he has lately re-manufactured himself from the days when he briefly served as a figurehead for the “de facto” government that replaced Aristide in 1991. But later switching gears, he then went on to serve as a minister in two subsequent Lavalas governments. Without a Father Jean-Juste to galvanize the Haitian masses, Lavalas’ leadership may best be served by aligning with Bazin or, of course, Préval. Moreover, since the anti-Aristide de facto coup of 2004, it has only been Bazin among the traditional leadership sector, who has supported Lavalas and he was also very forthright in criticizing the interim government’s egregious incompetence. Between now and February, much is likely to happen; at that date the victor in the run-off is scheduled to take office, but first the U.S.-led anti-Aristide cabal has much to lose if the electoral process continues to take a chaotic course. If one views the forthcoming elections in Haiti as a mindless exercise in “procedural democracy,” the vote itself will provide far from indisputable evidence of quality governance. Haiti’s basic fact of life today is that neither economic nor political democracy exists in the country, and no one could venture to claim that the vote of a subsistence farmer in Haiti’s Artibonite valley will carry the same political weight after the election as that of a Pétion-ville businessman. In underdeveloped nations around the world, where class cleavage stands out as an overwhelming fact of life, a political rhetoric is being called into play which claims that it means to empower the intended audience. The language of political discourse today in Haiti among the poor is not unlike that found in the “favelas” of Sao Paulo, or the broken barrios of Lima – the rhetoric may be similar because the basic conditions that spawn the despair is almost interchangeable. The most gifted politicians, like religious leaders, are suppose to make the electorate feel germane to the political process and convinced that they are vital to their nation’s future. Aristide was particularly adept at empowering the poor. But for the United States, the very concept remains almost a frightening specter. It is almost synonymous with Fidel Castro, therefore making it an abomination for Washington, therefore sealing the Haitian leader’s fate and the island with him.